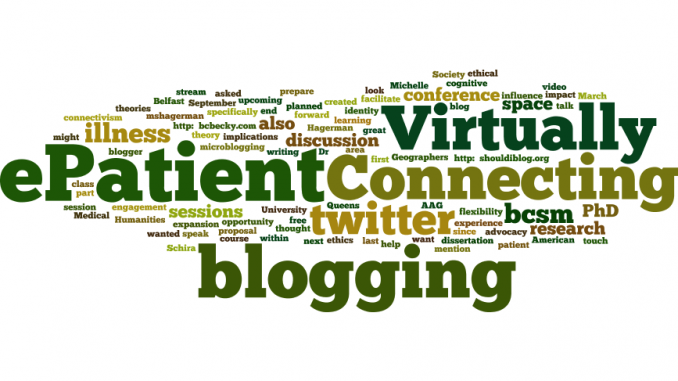 When Dr. Michelle Schira Hagerman (@mshagerman) asked me to speak to her class about my experience as an ePatient blogger and my upcoming PhD research I thought it would be a great opportunity to facilitate an expansion to Virtually Connecting. I have wanted to do more in Virtually Connecting in the ePatient space since we did the first sessions at the Queens University of Belfast ePatient blogging and microblogging conference last September. In the discussion, I talk about the impact illness blogging (http://bcbecky.com) has had on me, but also the ethical and identity implications of blogging about illness. I mention a free course I created to help those who might want to blog through their illness (http://shouldiblog.org). I mention a twitter chat that helped me get connected and talk about breast cancer (#bcsm). We also touch on the learning theories that influence my research, specifically connectivism and cognitive flexibility theory – both of which I’ll be writing more about as I prepare my PhD ethics proposal and dissertation. I look forward to doing more Virtually Connecting sessions within the ePatient (patient engagement and advocacy space). The next session in this area is being planned as part of the Medical Humanities stream at the American Society of Geographers (AAG) conference at the end of March.